Hello everyone! Today I am guesting over on A Blog Named Hero. They are having a month long celebration of Christmas Favorites. For my "Favorite" I chose Poinsettia's for the pure reason that every time I see one I am reminded of my Gram. I remember seeing them in all different colors in her bedroom as I was growing up. She loved them and she used to have them in every color. Make sure you leave some love on all the blog posts over there this month too. Simon Says Stamp is giving away 2 $25 Gift Certificates and Hero Arts is offering a prize package....which I am sure is AMAZING!!!! Love the white colour of the flower. What did you use? Michelle, your cards are so stunning! Thanks so much for sharing your technique! Love your white Poinsettia! It's seriously stunning with those bright green leaves and gold background!! Gorgeous card, Michelle! 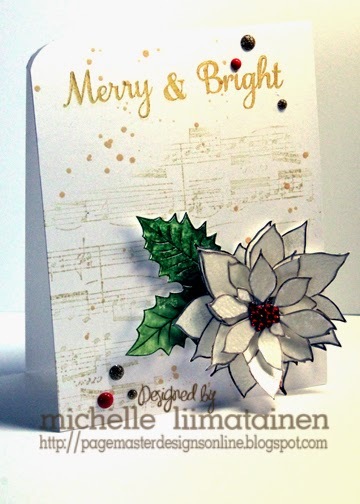 I love the musical notes in the background and your white Poinsettia is STUNNING! Loving the gold sentiment and splatters, too!